NEW REVIEW FOR LIBERTY GIRL AND FREE COMIC OFFER! 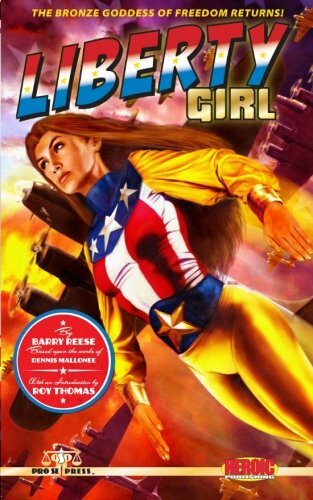 Fantastic Review for Pro Se's prose debut of Heroic Publishing's LIBERTY GIRL written by Barry Reese! Get your copy today and find out for yourself! And, remember, anyone who gets a copy and emails proseproductions@earthlink.net receives a FREE digital LIBERTY GIRL comic! Excellent stand-alone novel that pays winking tribute to another 40's pulp hero in an fun way. Even without that sly nod, the novel is an excellent two-age story of one person, Liberty Girl, who has to come to grips with something very unusual that happens to her. How it affects her and those around her drives the story without making it a one-gimmick plot. Wonderful story-telling! PRO SE PRESENTS: THE PODCAST RETURNS-EPISODE 11- NEW YORK TIMES BEST SELLING AUTHOR PHILIP ATHANS TALKS PRO SE!